Local people justifiably call Tenby the prettiest seaside town in Wales. The original town was called Dinbych y Pysgod, the Welsh for "little town of fishes". It was built by the Normans as a fortified town and most of the old town walls remain but only a small keep tower of the castle remains. Regular boat trips run from Tenby harbour to Caldey Island. This is a conservation area owned by the Cistercian Order and has an active monastery. Nesting seabirds including Puffins can be seen on the tip of the island. Fun, pedal and banana boats can be hired from Tenby Harbour Beach along with mackerel fishing and paragliding trips. The Tourist Information Centre is located next to the multi storey car park and there is a Visitor Centre by "Five Arches", one of the gateways into the old town. The classic postcard view of Tenby harbour lined with its pretty pastel-painted houses is from The Norton, a road that runs along the cliff top above Tenby North Beach. With the changes of light and tide, the scene is forever subtly changing and worthy of a good few hours of contemplation. 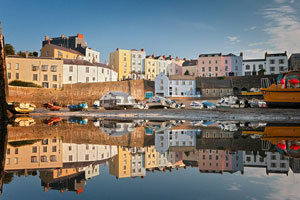 Venture down to Tenby North Beach, where if the weather is sunny and dry there are plenty of photo opportunities. If you can plan to visit when the tide is out, then you will find a vast expanse of beach with Goskar Rock in the centre to admire. Tenby is both a pleasure and a surprise when entering through the town wall into the maze of streets hosting a number of shops - both independent and chain stores. If there is a need to stop and rest whilst shopping, pop into at the Qube restaurant for a very tasty bowl of cawl, smoked cheese and homemade bread. Also make sure to sample the many flavours of fudge on offer in the local sweet shops. You can also enjoy Tenby Country Market held every Friday morning. The tide times are important when visiting Tenby Castle Beach as at high tide the beach completely disappears. It is sheltered by cliffs and can be accessed from the harbour or off The Paragon. Tenby South Beach looks out to Caldey Island backed by sand dunes, it is a popular sandy beach which can be accessed at low and high tide. There are a number of large nearby tourist attractions. These include The Dinosaur Park on the way to St Florence; Heatherton Sports Country Park is a mile further along the same road and Manor House Wildlife Park, owned by Anna Ryder Richardson of Changing Rooms fame, is on the opposite side of the road. In the opposite direction is the Folly Farm theme park. Finally there is paintball heaven at Battlefield Live in Llanteg, 8 miles to the east. Out of season, there are various annual attractions including the Tenby Arts Festival in the last week of September and the Tenby Blues Festival in mid-November. See more things to do in South Pembrokeshire. Looking for somewhere to stay near Tenby?